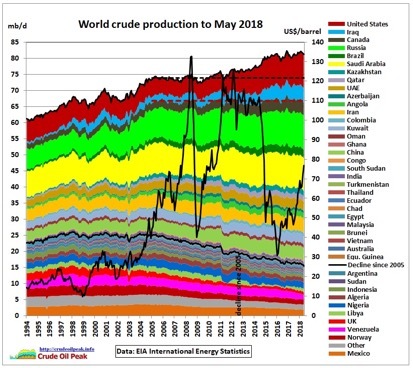 Note: world oil production, outside of the USA and Iraq, has been flat since 2005. The net increases are all due to the increases in those two nations. Both illustrations are by Matt Mushalik. Bloomberg reported last week that Saudi Arabia might allow crude prices to rise above $80 per barrel as the market adjusts to the start of US sanctions on Iran. In response, President Donald Trump sent a tweet on Thursday calling for OPEC to lower oil prices. The general feeling among analysts seems to be that you can’t tweet oil out of the ground and that tighter markets are ahead. Last week’s market strength was bolstered by a fifth weekly US crude inventory drawdown and strong domestic gasoline demand. U.S. crude inventories fell 2.1 million barrels last week to the lowest level since February 2015. Gasoline stocks fell 1.7 million barrels versus forecasts for a 100,000-barrel drop. Gasoline consumption usually picks up in the summer and wanes in autumn, but demand remained strong in the latest report, at 9.5 million b/d. The OPEC Production Cut: In Algiers, the 24-member coalition including OPEC and Russia ended their meeting on Sunday with no formal recommendation for any additional supply boost. However, Oman’s Oil Minister and his Kuwaiti counterpart told reporters that producers had agreed they needed to focus on reaching 100 percent compliance with production cuts agreed to at an OPEC meeting in June. That “focus” effectively means that the meeting decided to increase production without setting any specific goals for individual countries. Thanks mainly to falling production in Venezuela, the OPEC+ consortium produced at 129 percent of the objective they originally set. Iraq and Russia have been saying that they can increase production quickly. Tehran is unlikely to be happy with this development, as its OPEC governor has accused Saudi Arabia and Russia of being in cahoots with the US to undermine other OPEC members and destabilize the oil market. Saudi Arabian leaders find themselves in a tight spot. The Saudis, who lead OPEC, face pressure from President Trump to increase production to stabilize crude oil prices. But the Saudis must also appease their fellow OPEC countries, which could threaten their leadership within the oil cartel. OPEC and Russia were unified in their efforts to reduce production the past two years to push prices up. The alliance with Russia is critical for the Saudis and they want to make it a permanent institution. Some analysts have doubts that the 24-member OPEC+ consortium can raise oil production enough to offset the million barrel + drop in Iranian exports that US sanctions on Iran might bring about. The insurgency situations in Libya and Nigeria could easily lead to lower production in the next year or so. 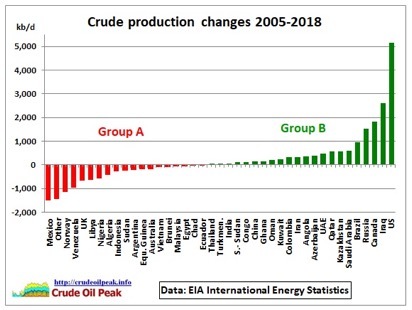 It is perfectly evident that all oil exporting countries want to see oil prices as high as their customers can bear without causing a significant drop in demand as was seen in 2008. US Shale Oil Production: Crude oil production from US shale deposits will hit 7.59 million b/d next month, according to the EIA’s latest Drilling Productivity Report. This production level is 79,000 b/d more than this month’s estimated production. The most significant increase, once again, is supposed to come from the Permian Basin, where producers will add 31,000 b/d to overall daily output from the current 3.427 million b/d to 3.458 million b/d. The second-largest contributor to the monthly increase will be from the Eagle Ford, where the EIA estimates production will rise by 16,000 b/d to 1.449 million in October. Countering all the talk of bottlenecks in getting oil to market from the Permian Basin, was the announcement last week by Plains All American L.P. that it will begin operations on an expanded West Texas oil pipeline on Nov. 1. The extended Sunrise pipeline, when completed, will add 500,000 b/d from Midland to Wichita Falls, Texas, with connections to the crude storage hub at Cushing, Oklahoma. The notice did not say how much new oil the extended Sunrise pipeline will be able to carry at the outset. The Sunrise pipeline will be capable of transporting 360,000 b/d by the first quarter of 2019, enough new capacity that Permian producers can expand production over the following six months, according to a research analyst at East Daley Capital Advisors. Pipeline operators are planning to add 3 million b/d of takeaway capacity from the Permian by the end of 2020, almost doubling the region’s current 3.5 million b/d according to energy consultancy Wood Mackenzie. On the downside, West Texas Intermediate at Midland traded on Thursday at a discount of $15 a barrel to US crude. These deep discounts have been going on in recent months as crude producers in the Permian Basin struggle to find space on pipelines amid rising production. Moreover, a new report from the EIA indicates that the growing shortage of pipeline takeaway capacity in the Permian Basin is resulting in some companies reallocating capital earmarked for Permian drilling to other areas in which they produce. While drilling in the Bakken basin has increased significantly this year, more activity means that drillers are being forced into less desirable locations. As a result, the majority of wells in the Bakken could shift from having an initial monthly production of 1,000 b/d to a majority of wells with just 500 b/d of peak performance, according to a study from the North Dakota Pipeline Authority. This drop in productivity would require a doubling of well completions to keep production level and increase costs. Outside analysts have been warning for years that large decreases in production would come as the most productive “sweet spots” are used up. One sign that the fracking industry is becoming concerned about water is that there are now societies and conferences dedicated to the topic of “produced water.” Produced water is the industry term for the toxic water that is “produced” over the life of a fracked oil or gas well. According to a study by Wood McKenzie, the costs of water disposal for the fracking industry could add another $6 per barrel of oil produced. For the US shale oil and gas industry, which has consistently lost money over the past decade, adding another $6 per barrel in costs would have significant effects. Iran: Most of the Iranian oil news last week concerned falling sales due to the US sanctions and how Tehran will fare at the Algiers OPEC+ summit. It now seems that Japan, India, and South Korea will cut back or stop Iranian oil imports. European importers are also likely to cut back, leaving Chinese and other refiners. At least 7 Iranian owned oil tankers have turned off their transponders, which makes it more difficult for commercial “tanker trackers” to figure out where oil leaving Iranian ports is going. Iran’s LPG shipments in September dipped to 356,000 tons after hitting 568,000 last month, the highest since previous Western sanctions were lifted in January 2016. Iran could lose up to 1.4 million b/d of exports by the end of the year, according to the latest projections by Platts Analytics. Tehran has already announced that it is opposed to any increase in oil production which it sees as merely aiding the US in finding sources of oil to replace those Washington is attempting to shut in. Because any OPEC agreement requires unanimous consent, Iran could block any changes to the formal oil production cut deal. The specifics of the June agreement, which called for increased production on the order of 1 million b/d, were not hammered out. Tehran rejected a new US offer of negotiations on Thursday, saying Washington had violated the terms of the 2015 nuclear accord. The US special envoy for Iran said on Wednesday that Washington now wanted to negotiate a treaty that included Tehran’s ballistic missile program and its regional behavior. Hook said the new deal that Washington hoped to sign with Iran would not be a “personal agreement between two governments like the last one”, but a formal treaty. Gunmen fired on a military parade in Ahvaz, which is in southwestern Iran, on Saturday, killing 24 people, half of them members of the Revolutionary Guards in one of the worst attacks ever on the elite force. More than 60 people were wounded as the attackers targeted a stand where Iranian officials had gathered to watch an annual event marking the start of the 1980-88 war with Iraq. Iraq/Syria: According to the director general of Iraq’s State Oil Marketing Organization, Baghdad can increase oil production “immediately” to support the market ahead of the implementation of US sanctions on Iran which is expected to lose on the order of 1.4 million b/d in exports by the end of the year. Iraq pumped 4.68 million b/d last month, up 110,000 b/d from July and the highest recorded in the 30-year history of the Platts OPEC survey, as exports from both the country’s southern port of Basra and through the Turkish port of Ceyhan saw increases. However, a new report on Iraq’s oil production capability says a series of problems, including export bottlenecks caused by a lack of infrastructure, will continue to limit the country’s oil output for years to come. The report, from the London-based consulting firm IHS Markit, found that while Iraq could theoretically produce about 7 million b/d, in practice the connections between its oil fields and storage farms and the export terminals in the south will be bottlenecks. A spokesman for HIS Markit says that Iraq would be lucky to reach 5 million b/d by 2028, and 6 million by 2036. Before the civil war, Syria produced over 400,000 barrels of oil per day. But by 2013 the number had dropped to 58,000. In January 2018, Syria’s President Bashar al-Assad had signed an agreement with Russian President Vladimir Putin giving Moscow sole rights to oil and gas production in Syria. With a well-armed corporate militia, Gazprom and others can aggressively protect assets at home and abroad and may soon play a significant role in Russia’s energy plans for Syria. Russia will be expected to pump $30 billion or more into restoring Syria’s energy infrastructure. In exchange, Russia will have a stronger presence in the Middle East and the eastern Mediterranean. Assad has responded generously with an invitation to such firms, promising lucrative incentives for companies willing to restore Syria’s energy infrastructure. Saudi Arabia: Oil prices were up last Tuesday on reports that Riyadh would be comfortable letting oil prices rise above $80 a barrel and OPEC may not be rushing into further production boost commitments after the one they agreed upon in June. In July, Saudi Arabia’s oil stocks dropped by 5.51 million barrels, after the Kingdom unexpectedly reduced its production compared to June while it kept exports stable. The Saudis pumped 10.49 million b/d in August, far above its quota of 10.06 million b/d under the supply cut agreement, but below the 10.8 million to 11 million b/d that it had signaled it would produce at the June meeting. Russia and Saudi Arabia will continue co-operating on the design of a framework for long-term relations between OPEC and its external partners, according to a Russian Energy Ministry statement. The statement was released following a meeting between Energy Minister Novak and Khalid al-Falih. Saudi authorities are seeking the death penalty for three prominent clerics, rights activists and a government official said, testing the unwritten code that has kept the kingdom’s rulers in power. Crown Prince Mohammed bin Salman and his father, King Salman, have jailed activists, businessmen, and government officials as part of their efforts to reshape Saudi society and economics. However, Saudi clerics have been a power unto themselves for decades, with fame and influence beyond that of wealthy, and allegedly corrupt, businessmen including members of the royal family. Moving against clerics could turn public opinion against the kingdom’s rulers. Signs of political instability in a country producing so much oil is always troublesome. US crude oil exports have been temporarily spared from Chinese tariffs, giving state-run oil refineries a short window to import as much as possible. They’re scrambling for US imports because WTI, the US benchmark, is selling at a $6.66 per barrel discount to Dubai crude oil. That’s the biggest price difference of the year. Although the tariff on LNG announced last week was only 10 percent, rather than the initially threatened 25 percent, it is still bad news for US LNG producers. China’s procurement is widely seen as the major driver for future LNG demand as Beijing’s anti-pollution fight focuses on a shift from oil to gas. Shipments of LNG from the US to China remain cheaper than other sources despite a 10 percent tariff. However, the political risks may deter Chinese buyers from US cargoes even if they are a lower price. Despite the urgent demand for more natural gas, Chinese buyers are likely to seek longer-term LNG contracts from politically neutral sources such as Qatar and Australia. China’s demand for diesel has peaked, and gasoline demand will soon follow, research from state energy giant CNPC has revealed. Reuters says CNPC’s research division is also saying that crude oil demand in the country will stop growing at a level of 690 million tons annually—13.8 million b/d—which is set to happen in 2030. Gasoline demand will peak around 2025. As Beijing tightens environmental regulations, it is dampening demand for fuels. Economic growth is also slowing, further hurting demand. While economic growth could rebound, the environmental regulations are likely to stay in place as the country battles one of the worst pollution levels in the world. Moscow’s oil production could peak as early as 2021 due to high taxes and costs provided there are no benefits for exploration or tax incentives, Energy Minister Novak said last week. Moscow’s oil production is expected to average around 553 million tons this year, or 11.105 million b/d. The Interfax news agency quoted Novak as saying that by 2021, Russia’s oil production will rise to 570 million tons, which, without more benefits and lower taxes, could be the peak of its oil production. If current production trends continue, and if Russia doesn’t do anything to further stimulate oil exploration and new field development, after 2021 production may start to fall and reach just 310 million tons by 2035, that is, Russia’s oil production could drop by 44 percent in the next 18 years. Exploration and new oil field development are becoming increasingly important for Russia’s oil industry, Prime Minister Dmitry Medvedev said at the meeting, adding that the government needs to assess reserves and draft measures for incentives. Minister Novak cited “increased production costs and excessively high taxes in West Siberian oil fields” as part of the problem. Western analysts have been saying for years that without the discovery of major new sources of oil production, Moscow’s aging fields should be slowing soon despite constant in-field drilling. A significant quantity of production from polar fields is still a long way away and, despite talk of massive US-style shale oil deposits, nothing of significance has been announced. Russia’s Novatek is set to start exporting LNG from its third 5.5 million ton/year train at the Yamal LNG project by the end of 2018, CEO Mikhelson said last week. Mikhelson noted that Novatek could review its strategy to reach 57 million tons/year of LNG production by 2030 in the coming years as it continues to expand its vast gas resource base in northern Russia. He also said he expected some 80 percent of its future LNG production to serve the Asian market, with future sales to China in Yuan under consideration. The company is also close to making a final investment decision on a new LNG plant — Arctic LNG 2 — which would have a production capacity of 19.8 million tons/year. Gazprom and Tokyo-based conglomerate Mitsui & Co. signed a memorandum of understanding on LNG development last week. The deal includes building an LNG plant on the Baltic Sea coast and would mark the two companies’ second joint LNG project. Currently, Japan – the world’s top LNG importer – is also the largest buyer of Russian LNG, importing a 36 percent share of the Moscow’s LNG production. So far, 2018 has been a good year for Gazprom, the biggest investor in oil and gas projects in the world, with $160 billion worth of investments. Gazprom has seen an end to its legal battles with the European Commission and additional pipelines are under construction to the east and west. The Nord Stream 2 is continuing despite frictions between the US and Germany and opposition from Eastern Europe. The first phase of Turk Stream for the domestic Turkish market has been completed while the second pipeline for the European market is under construction. In the east, the highly publicized ‘Power of Siberia’ pipeline to north-eastern China is on schedule to be completed on time. Russia has more of a future in the lower-polluting natural gas world where it can build pipelines to Asia and Europe than in trying to scrape more oil from its aging oil fields. The scandals surrounding Nigeria’s oil industry roll on and on. Last week an Italian court sentenced two intermediaries to four years in prison. The case relates to the 2011 purchase by Italian oil company Eni and Royal Dutch Shell of an offshore oilfield for about $1.3 billion. Prosecutors in Milan noted that there were allegations of bribes totaling around $1.1 billion said to have been paid to win the license to explore the field, which has never entered into production. The prosecutors say that money from the deal wasn’t transferred to Nigeria where the oil field is located but ended up in accounts controlled by former Minister of Petroleum, Mr. Dan Etete. The Nigerian government received only $210 million. This trial was a separate fast-track one which, under Italian law, allows sentences to be cut by a third. The main trial, which is expected to go on from months, involves Eni CEO Claudio Descalzi and four ex-Shell managers, including former Shell Foundation Chairman Malcolm Brinded. According to one observer, this judgment will send shivers down the corporate spines of the oil industry — and will surely alarm Shell and Eni employees and shareholders who have been repeatedly told that there was nothing amiss with the deal. In a separate case, Nigerian police announced last Thursday that they had recovered $470.5 million (€400 million) in state oil company funds that had been siphoned off into private bank accounts. Police said they discovered the money linked to the Nigerian National Petroleum Corporation’s Liquefied Natural Gas business unit during a nationwide exercise to recover stolen funds. The government sold 9.9 percent of the shares in joint oil venture Sinovensa to a Chinese oil company, President Nicolas Maduro said after returning from China last week. He also said that Venezuela expects some $5 billion in the joint investment with China to boost its crude output. The Sinovensa sale forms part of a plan to invest $5 billion over the next year in projects to double oil production and be able to send a million b/d to China. Given that Venezuela’s oil production is at a 60-year low and currently is just above 1 million b/d, it is doubtful Caracas will be able to come up with 1 million b/d to pay off the existing Chinese loans much less any new ones. The exodus of starving people from Venezuela continues to grow and is at the point where neighboring countries can no longer cope with the influx. Three years ago, some 87,000 Venezuelans were believed to have crossed into neighboring countries in search of food. This year the number will be on the order of 1.5 million. Given that Venezuela has a 1400-mile border with Columbia, border crossing is impossible to control. Peru, the No. 2 recipient of Venezuelans in the Americas, has an enclave of more than 350,000 Venezuelans, up from 2,300 just three years ago, the International Organization for Migration said. Meanwhile, domestic troubles continue to grow. Dozens of Venezuelans on Friday brought the city of San Cristobal to a standstill by blocking roads with their cars to protest gas shortages. Venezuela, where gasoline is selling for around a third of a cent per gallon, has been plagued by intermittent fuel shortages in recent months as its oil industry suffers from lower production and failing refineries. The problem was compounded this month when the government rolled out a new payment-for-gasoline system in eight states near the Colombian border, in an attempt to halt the widespread smuggling of Venezuela’s gas to Colombia. The payment system, which will pave the way to charging international prices for fuel, involves providing gas stations with wireless devices that use a state-issued identification card to purchase gasoline. The new document, called the Fatherland Card, is meant to provide subsidies to motorists to help soften the impact of the steep price increases. Nuclear pickle: the Vogtle plant is the only nuclear power plant under construction, or even under serious consideration, in the US. If work on it stops, the prospects for new nuclear power in the US would dim considerably and raise the question of whether the country can revitalize its nuclear industry. The project is billions of dollars over budget and years behind schedule and expected to cost upwards of $27 billion, more than double the original price tag estimated when work began a decade ago. It has received $12 billion in federal loan guarantees, including $3.7 billion from the Trump administration last year.